Welcome to Callaway Apartments, where functional living space meets extraordinary community benefits. 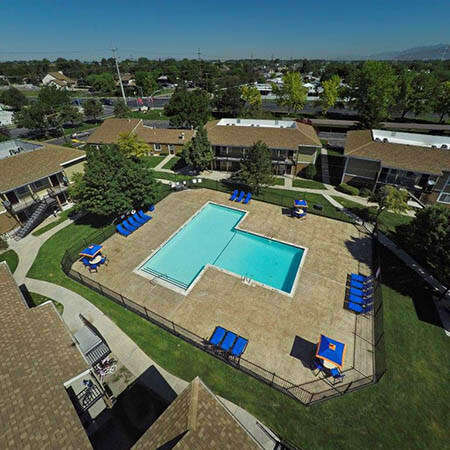 We offer one and two bedroom apartments in the south Salt Lake City neighborhood of Taylorsville, UT. All of the standard amenities you’ve come to expect from a modern apartment home are included in each of our units. Take advantage of everyday conveniences, such as walk-in closets, dishwasher, and central air. If you’re looking for an upgraded apartment, choose from one of our many newly remodeled units. Upgraded features include easy-to-clean wood-style floors, stainless-steel appliances, and in-home washer and dryer. Enjoy the very best in community benefits at your new apartment home just south of Salt Lake City. Your new community is built for fun, recreation, and relaxation. Spend the day in one of the swimming pools or at the playground and then kick back for an evening among friends and family in the Clubhouse. No matter what your sport, there’s space to play at Callaway Apartments. Our expansive property features courts for basketball, racquetball, and tennis, in addition to a soccer field and two dog parks. There’s a place for the vehicles, too, with covered parking and RV parking. Taking care of business is easy at Callaway Apartments. Our Clubhouse has a business center, WiFi access, package acceptance, and community laundry facilities. One of the best community benefits is our unbeatable location in the Salt Lake Valley. Salt Lake Community College, TRAX, and downtown Salt Lake City are minutes from your Taylorsville home. Contact our friendly team today to learn more about these Taylorsville apartments for rent. We’re excited to show you around.